The James Webb Space Telescope (JWST) is the much anticipated, long awaited “next generation” telescope. Planned for launch in 2013 October 2018, JWST has been touted as the successor to the Hubble Space Telescope. With it, astronomers hope to look back in time to when the universe was just 200 million years old, and see the first stars and galaxies. The lead scientist guiding this project is Dr. John Mather, co-recipient of the 2006 Nobel Prize in Physics for his work with the Cosmic Background Explorer (COBE), which measured the black body form and anisotropy of the cosmic microwave background. Universe Today: Dr. Mather, for over a decade we’ve been hearing about the Next Generation Space Telescope, which later was officially named the James Webb Space Telescope. Can you tell us how the concept for this telescope began? John Mather: In 1989, even before the Hubble was launched, a conference was held about what the next space telescope should be. They discussed great telescopes of the future and from the proceedings, published a book. But they really didn’t consider that infrared was the great wave of the future. Then, in 1993, there was a committee called HST and Beyond. They published a lovely little report in 1996 that said there were two important things to do. One was to build an infrared telescope, unlike what the previous book had said, and the other was to build a telescope to search for Earth-like planets. At that point, astronomers were just recognizing that searching for extrasolar planets was possible. So in October 1995, NASA Headquarters called me up, gave me a list of scientists and engineers to contact and said to start planning. So we did, and we immediately came to a remarkable convergence of thought and opinion. We quickly agreed on a concept which met the wishes of the scientific community and came within the ambitions of NASA. You’ll find that the telescope we wanted to fly back then is very much like the one we’re going to fly in 2013. UT: Can you give us an update on the status of the JWST right now? Mather: The flight instrument hardware will be coming in from all over the world in the summer of 2010. The fine guidance sensor comes from Canada, one and a half instrument packages come from Europe and the rest comes from the US. So, in 18 months the instrument package starts going together, and then it meets up with the telescope around a year later. The four science instruments are a near-infrared camera, a near-infrared multi-object spectrograph, a mid-infrared instrument, and a tunable filter imager. We just went through the Critical Design review for the instrument module. Last week we had hundreds of people come to look at everything and tell us if we’re doing it right. I think we passed, although I haven’t seen the official paperwork yet. But even I was impressed. UT: The question many people ask me is, since Hubble has been so successful, why isn’t JWST going to be an optical telescope? Mather: Why did the committee change from optical to infrared? It was twofold. One was that Hubble was getting so good, they could see it would be hard to beat it, no matter how big you built a telescope. Another thing happening was that people were seeing you could build big optical telescopes on the ground. The Keck Telescope was working really well, and people were starting to talk about adaptive optics, which meant even bigger telescopes on the ground were worthwhile. So those two things pointed us towards an infrared telescope. Also all the scientists of the JWST said we needed infrared. From the little capability we did have at the time, infrared was fascinating, finding that the most distant universe is exciting and is red-shifted from the visible. It starts out in ultraviolet and gets to infrared because of the great distances of these objects and the huge red shift they have. So if you want to do ultraviolet astronomy at the almost-edge of the universe you need an infrared telescope. UT: Now that the infrared Spitzer Space Telescope is up and running so well, has that changed anyone’s mind, or does that make scientists want to go to the next level with infrared? Mather: Yes, Spitzer has proved this is actually a fascinating territory. Spitzer is actually a little bitty telescope by modern standards; it’s only 3 feet wide, 85 cm. But it has been producing some astonishing surprises. They can see things out to very, very high red shifts, and none of those things were expected. So, that tells us infrared is where the wonderful discoveries will be. We now know we can do the technology, so let’s get a better telescope. The science is way, way exciting, and there’s so much out there waiting to be discovered. UT: In your opinion, what will set the JWST apart from previous space telescopes? Mather: Every telescope says, “I’m better than the one before me,” and we say the same. Of course, this telescope will see farther back in time with its infrared capability and its huge aperture; it will see through dust clouds to see where stars are being born; it will see things that are room temperature, like you and me, planets, or young stars being born. All those things can be seen directly with the infrared capability we have on this new telescope. Most of the work will be done in infrared, with some capability in the visible range. But we’ve built a general purpose telescope. After launch, scientists can write proposals as they do for Hubble, for what they would like to observe, so they can observe whatever the hot topic is at that time. UT: With your experience with COBE and the subsequent honors you received, how have you applied that to the JWST? Mather: It wasn’t so much the honors that affected my life, it was the fact of having been through the process from the very beginning to the very end for a very radically designed observatory, which COBE was, that gave me the nerve to think big things. So when NASA Headquarters said they wanted a successor for Hubble, I thought that would be interesting, and I had enough nerve to say yes, I’d like to try that. COBE was very ambitious for the time, but small enough that I knew the engineers personally and I could talk to them any day about anything. So I thought I could graduate to a bigger project. UT: And now you’re working with people from all around the world? Mather: Yes, this is a huge deal. Our science team is about 19 people, from Europe, the US and Canada. The engineering team is over 2,000 people who are spread out all over the world. Clearly, I don’t know all of them. I work with the scientists most closely and talk with them about what we want to accomplish, and make sure we are accomplishing that. So I have a different role now. I don’t have hands-on responsibility for any hardware, but I work with the people who do. We have access to some of the very best people in the world on every topic. UT: Can you talk about of the problems this telescope has had to overcome, the cost overruns and the delays it has had? Mather: Number one, the cost overrun is not as big as is being portrayed by some folks that would like the money for their own project ideas. Originally Dan Goldin was the head of NASA when we started, and he said, “We want you to think of a way to do this observatory for a half a billion dollars in 1996 dollars.” We said we’d try. But we quickly realized building this was going to be hard. By the time we got ready to present it to the decadal survey in 2000, the cost was more like one billion dollars. Then, three years ago, we saw that the job was getting harder and we had to replan and rebudget. Now, if you count the entire NASA cost from beginning in 1995 to the end, somewhere after 2019 with inflation and civil servants (which we weren’t counting before) now it is roughly $4.5 billion in actual real dollars, not 1996 dollars. So there is cost growth, but we have had excellent success and we’re on track to launch this wonderful machine, which will be used by thousands of astronomers. And we haven’t had to change our plan or our total budget in three years, thanks to steady leadership from NASA HQ and brilliant technical work by the teams. UT: That’s good to know. I think people have a general concept that the JWST has had a huge cost overrun. Mather: Well, it’s not something small, and we wish we could have done better on that. But it’s about a factor of two growth, and not the factor of five that has been advertised by some people who should know better. This telescope will work for a long time. The requirement is five years, but we’re hoping to run it for ten. So, our project spans from 1995 to maybe 2024 when operations would end. Let me give you some idea of what we needed to do to get ready and what we’ve been up to all this time. We developed a list of ten major technologies that we needed. The hardest thing was to develop the mirrors. That required twelve different contracts just for developing the competitors to where their designs were good enough, so that took quite a few years. The detectors clearly had to be improved over what we have on the Spitzer and Hubble telescopes. So now we have bigger and better detectors, and they are fabulous. One measure astronomers have is how many stray electrons do you get from the detectors. If you close off all the light you should get zero. We now have detectors that give off a few stray electrons per pixel per hour, which is almost perfect. It would be good to be even better, but this is fabulous. I’m impressed. We needed to improve on the refrigerators in space. We started off saying we need to get a radiatively cooled telescope so that it would be cool enough by itself, and that’s mostly true. But it turns out we still need an active refrigerator to keep the longest wavelength detectors cold, so we had to develop that. So, just getting to 2007 was a long time, and I don’t think people have really appreciated what it takes to get new technologies ready. On the other hand, we’ve been blessed by not having to “back up.” We put enough planning and effort into these technologies that they work now. That was one of the things we learned from the Hubble project, which was, don’t finish your design until you know what you’re supposed to build. UT: How about your testing process. Is it pretty rigorous? Mather: That is another lesson we had to learn from Hubble. If you don’t test it, it’s not going to work. We’ve learned to have a very determined and rigorous process. They did enough testing on the Hubble that they could have known about the mirror focus problems. The mirror manufacturer had two tests that didn’t agree and they decided to ignore one of them instead of tracking down the reason, and that turned out to be foolish and expensive. We have a generalization that if anything really matters, do it twice. We will actually test the telescope cold in the big vacuum tank down at Johnson Space Center. So it will be a full-scale end-to-end “light-in-at-the-beginning, light-out-at-the end” sort of test, something they could not do for Hubble. But they knew they could go fix Hubble in space, and we know we can’t fix JWST, since the telescope will be at the L-2 point, about 1.5 million kilometers away from Earth, which is about four times further away from the Earth than the Moon. This is a complicated project, but our approach for doing a complicated project is dramatically different from when I was a young feller. When I got here to Goddard, we used pencils and slide rules, and computers were pretty new and most people didn’t have them. Now we have computers everywhere that keep track of our documents. We can do systems engineering, and even can do very accurate, complete simulations to know if something will fit together and work before we even built it. So the world has changed, and it’s a wonderful thing to see. So this is why we are now able to build this observatory for about the same real cost as it took to get the Hubble launched and working. But JWST is so much bigger and more powerful. 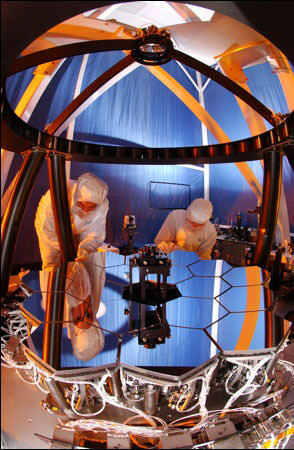 UT: Can you tell us about the design for the mirror for the JWST? Mather: The hardest thing to build was the mirror, because we needed something that is way bigger than Hubble. But you can’t possibly lift something that big or fit it into a rocket, so you need something that is lighter weight but nonetheless larger, so it has to have the ability to fold up. The mirror is made of light-weight beryllium, and has 18 hexagonal segments. The telescope folds up like a butterfly in its chrysalis and will have to completely undo it self. It’s a rather elaborate process that will take many hours. The telescope is huge, at 6.5 meters (21 feet), so it’s pretty impressive. The sun shield is completely new, and it too will have to deploy. So, what was wrapped up into a small cylinder, relatively speaking becomes a giant shield about as big as a tennis court. It’s huge. All this happens in multiple stages and will take days. We hired a company, Northrop Grumman that had experience unfolding things in space, and they tell us this is definitely not the most complicated thing they’ve unfolded in space, which is reassuring. UT: Has there been any discussion of first light and what the JWST will look at first? Mather: Yes, a little. That will be the fun part after we get the thing put together. UT: Do you have any favorite suggestions? Mather: I think we should start with easy targets that will be pretty, that will enable the public to say, “Oh, I see its working!” Some of the first observations can be done when we’re setting up the telescope, even before it’s fully adjusted. Because it is deployed after launch and the mirror isn’t close to the right shape at first, we’ll be working up to this gradually. There’s a test model at Ball Aerospace in Boulder Colorado, where we get to practice putting the 18 mirror segments into position. Each segment has 7 motors on it to control the position and curvature, so we have to rehearse this one. This is something they couldn’t do with Hubble. They wished they could, and it did have motors but they couldn’t push hard enough. That’s an interesting story. We learned from Hubble how to correct the optics based on the images we were getting, so we’re doing it on purpose for this telescope. UT: There has been some controversy about how the JWST will be launched. Mather: We’ll take the telescope to French Guiana and load it in the rocket down there. The ESA is buying the launch vehicle for us; it’s the Ariane 5 rocket, a commercial product from Europe and they’ve had a good run lately, so it’s very reliable. UT: Your team still has a lot to do before 2013, which will probably be here before you know it! Mather: Yes, I know. It’s been over 13 years now since NASA contacted me about this, but now the end is coming up fast. We have plenty of technical challenges ahead of us in putting everything together. And we haven’t gotten far enough to along yet find out how many things we broke or how many mistakes we made, but I think we’re pretty good at figuring them out before we make them. It’s going to be very exciting to put the equipment together for the first time. We’ve got the pieces, we’ve got the picture on the box to show where they go, and pretty soon we get to prove that they work together, or not. By the time we receive all the parts here at Goddard, they will all have been tested individually, so they’re supposed to play together just fine. But nature doesn’t like arrogance, so we have to test the whole thing from beginning to end, just as we’re going to use it in flight. After we put it together here, we take it down to Johnson Spaceflight Center, and put it in the giant vacuum tank there. That will be an extraordinary process. UT: Thank you so much for talking with us. Mather: This has been fun. I love telling my story and I’m glad you want to tell it with us. I figured it might be time to talk about what we’re doing because exciting things are starting to happen. Magnificent things are happening. We’ve got the Kepler Observatory up now, and hopefully they’ll find a handful of Earth-like planets to track down and we’ll take a closer look at them. More information about the JWST. Additional images and videos can be accessed here. What wonders will it show us! In 1991, I went to La Paz to see the solar eclipse. I had a conversation with someone who was working on the project to fix the Hubble. He said that it was a horrendous project. At the time, no one was sure that it would work. You didn’t ask the most buring question: Orbiting at the Lagrange point puts it out of reach of any manned spacecraft. How will they repair or upgrade JWST? Gerald, the answer is in the interview — they’re not going to be able to repair/upgrade JWST, which is why they need to get it all right the very first time. Awesome!!! However, the biggest test is, will it un-fold the mirror segments without any problems? Northop Grumman may have made contraptions that unfolds but this is much more complex-I wonder if they will go into Earth orbit just in case of problems,if ok, the scope can be boosted to the final L2 region. As cool as GOCE looks, I think JWST looks better. We live in an exciting time for astronomy, and science in general. Also, don’t mean to jink the project but 7 motors for each mirror segment? That just shouts complication and I hope they get it right! Man, I almost crapped myself just watching the *simulation* of the unfolding process. I’m going to have a dead-set coronary conniption when this thing goes up for real. I can’t wait! I’m literally wishing my life away because I can’t wait to see the images this thing will produce. I’m a sad, sad science addict. Couldn’t they attach small droids with capabilities to repair it if something goes wrong? Kind of like iRobots? It seems like a big risk to send it into an L2 orbit before it’s completely deployed. 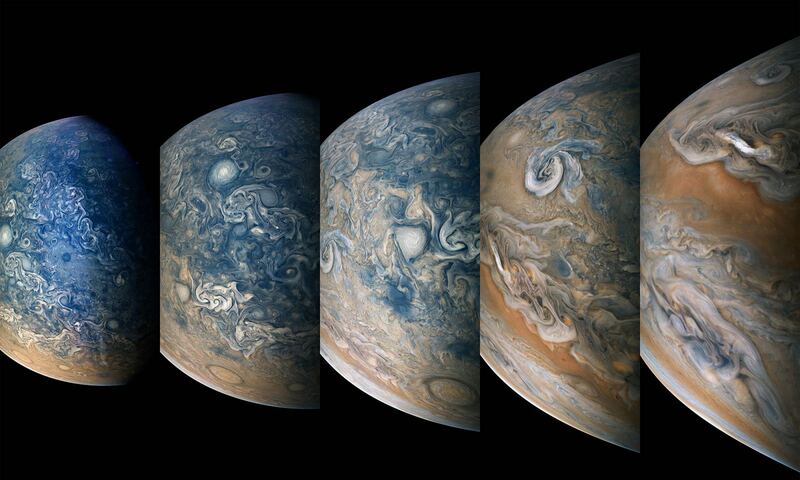 Space is an even greater tragedy as we all KNOW how much more there is to learn and experience which we can’t imagine yet, than will be possible during our lifetimes. 3) Manned missions to Enceladus, Europa, Titan, Triton, Saturn, Jupiter, Ganymede…. any of them, I’m not fussy. Mars would be cool but the outers are more mysterious and therefore exciting. And a last wish for someone to finally get an interstellar probe going! Even if it doesn’t make it while I’m still alive, just knowing it’s out there on it’s way would be very satisfying. I’d like to Thank John for joining us here. I love this site and it’s great to be treated to the real thing from the horse’s mouth, no insult intended Mr. Mather. I can’t wait for the JWST and the amazing pictures it’ll produce! It should be able to take a picture of an extrasolar planet and im really looking forward to New Horizons getting to Pluto! Design of JWST is really cool, it looks like a battle cruiser! So no astronaut can get to L2 at this time to service the thing. That capability may come later. They should design in SOME service-ability anyway. At least to “re-fuel” it with cryogenics. And is that liquid He or N? It would be really sad to have a great telescope at L2 in 10 years that is useless because we could go to it then but it can’t be “re-fueled”. On the non-serviceability of JWST, the spacecraft is being designed with a level of redundancy that is typical of nearly all exoatmospheric machinery: no single failure will result in loss of mission. JWST may still be operating when we’re able to fly a service mission, but we’re relying on fault-tolerant design, quality construction, extensive testing and state-of-the-art mission operations to assure a successful program. As to cryogenic refueling, only one of the four instruments requires liquid helium for its operation and the He is recycled in a cryocooler rather than used up. Finally, on having seven motors per mirror segment, that’s what it takes to get the segments positioned to within one wavelength of each other. The Hubble myopia problem cannot happen on this machine because the lenses (mirrors) are by necessity very precisely adjustable. Other problems may arise, but the inability to focus won’t be one of them. Mather is sounding more and more and more like a politician that a scientist. I don’t think we have refueling capabilities yet, and JWST must be too late in development for any such design to be implemented. A great pity, for Jules Verne has shown as that autonomous docking is feasible, and I look forward to the day that Dewars of LHe can be launched alone and swap out without any need for guidance from Earth. It’s called inflation, a concept that you obviously are incapable to understand. A human servicing mission to L2 would be extremely complex, risky and expensive. Probably better to build and launch a new telescope when JWST finally fails entirely. I believe it is you that has a hard time with the concept of inflation. The inflation rate from 1996 to 2009 has been approximately 36%. If inflation caused the price increase then the total cost of the program should be around 1.09 billion. ($800 billion in 1996). The cost increase have almost NOTHING to do with inflation. Even with factoring in inflation we see a factor of five cost increase….this is nothing near a “factor of two’ as Mather suggests. Math is hard….as is reality, apparently.